Two populations of Barnacle Geese winter in the UK: the Greenland Barnacle Goose, which breeds in northeast Greenland and winters exclusively in Britain and Ireland; and the Svalbard Barnacle Goose, which breeds in the Svalbard archipelago of northern Norway and winters almost entirely on the Solway Firth, primarily on the Scottish side. There is also a third population of Barnacle Goose: the North Russia/East Baltic population which breeds in the Russian Arctic and the Baltic and winters largely in the Netherlands. Very small numbers of this population occur in Britain, mostly in East Anglia, during cold weather influxes accompanying other goose species. 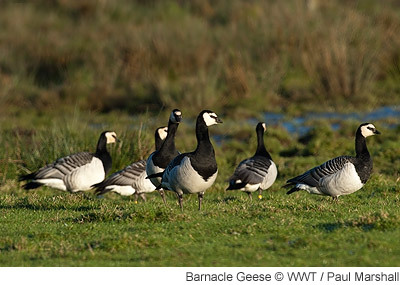 However, there is also a resident naturalised Barnacle Goose population in southern Britain, probably derived mainly from escaped and released birds, making it hard to assess the true scale of influxes by wild Russian-breeding birds. The Goose & Swan Monitoring Programme monitors the two wild populations that occur regularly in the UK.